Sometimes when you run a race, all the variables seem to be against you–you don’t get any quality sleep the night before, the sky decides to have a temper tantrum and rain down sheets of cold rain from the moment you step onto the starting line, the inevitability of personal loss looms over your head and makes you physically emotional as you slog up and down endless hills, and you miss the end time you planned for by 18 seconds. That’s what happened at my last half marathon. 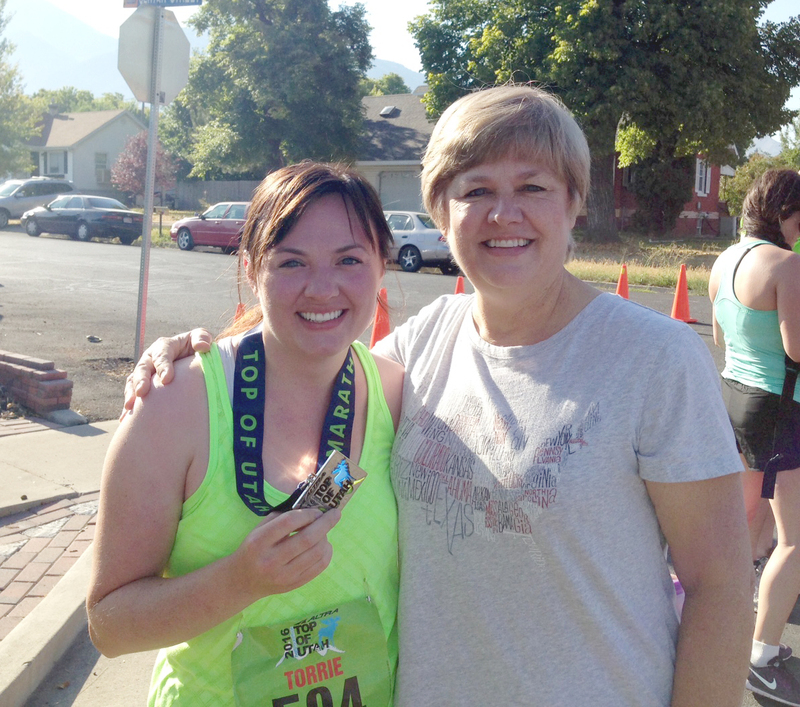 Sometimes when you run a race, you don’t set much of a goal other than to run the whole time, and you’re pleasantly surprised to find that you’re going to finish sooner than you expected, despite the temperatures being much higher than what you’re used to and despite the injury your running partner incurs just 4 miles from the finish line. Somehow though, despite it all, you end up finishing the race in a time you are proud of (especially since you thought you’d be about 20 minutes later than that, never having run any kind of distance event before), but not having gone for any time in particular, you’re more pleased with the idea of finishing period, rather than in doing the thing at a particular speed. That’s what happened at my full marathon. But sometimes–miracle of miracles–you get dealt a perfect hand of cool weather, a downhill course, enough sleep to get by on, and a healthy thirst to prove yourself. You are happy to discover 3 miles in that this isn’t just going to be a good run—this is going to be an AMAZING run: a run that feels easy, a run where at times you feel as if you are flying, a run where you hit all your mile splits and crush a few of them by almost a whole minute, a run where you literally have a tail wind gently but firmly pushing against your back as you head down out of the canyon, a run where you top your own personal best by over five minutes, despite the expectation that this race could very well not go in your favor due to shin splints and personal health issues and a whole lot of other things. 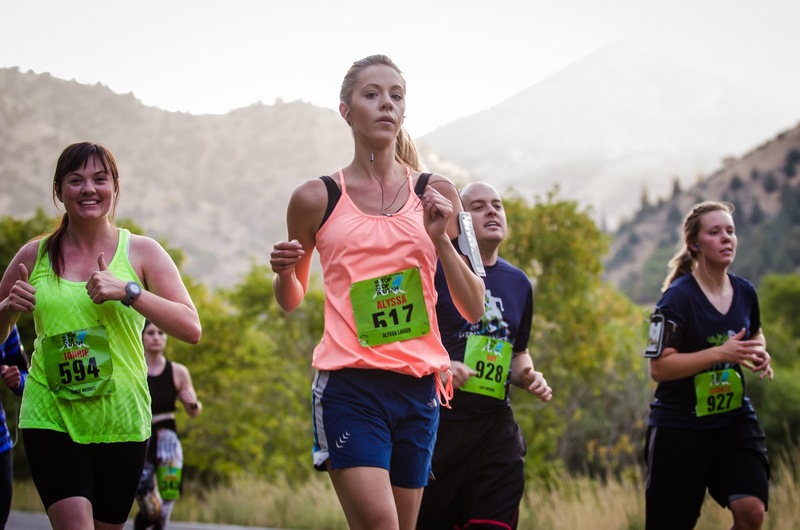 That was what happened on Saturday at the Top of Utah Half Marathon. I don’t think it’s much of a secret that I’m coming off of a bit of a rough year. Last July, I was diagnosed with an autoimmune disease that attacks both my skin and my muscles, which explained why I was waking up every morning feeling like I’d been hit by a car and why I would cry (or want to cry) every time I tried to hold Raven for longer than about two minutes. Everything hurt all the time, and when I went into the doctor to check my muscle strength, I could barely press against his hand, my muscle damage showing that my muscles were breaking down at an alarming rate, as if I were sleeprunning for 20 miles each night and never allowing myself a chance to recover. The treatments for my diagnosis were (and still are) hard, the threat of a new flare-up constant, and the trajectory of my life totally shifted, as the disease stipulated that I had to stop nursing, that I had to lie low for several months and not push myself when it came to exercise or stress or even counting calories, that I couldn’t (and still can’t) get pregnant until I’m completely off of all of them. 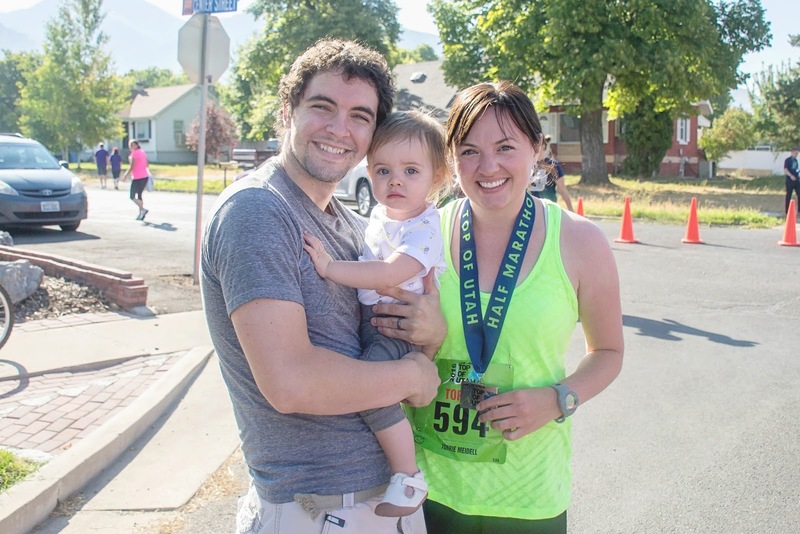 My journey back to a healthy weight and back to what I used to be able to do running-wise has been fraught with obstacles, many of which have been out of my control. 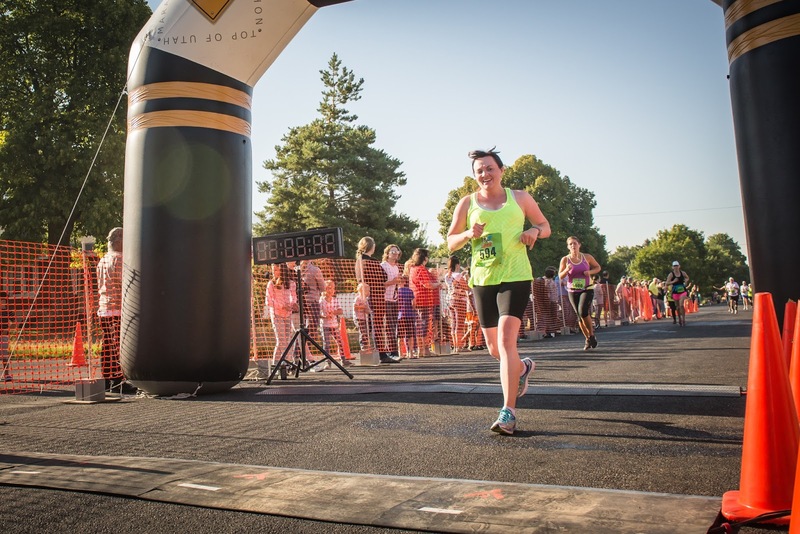 But because I love running and because I was determined to get healthy no matter what, I kept on pushing and running and being as consistent as I could be, even though results were always a long time in coming, and many of them never came at all. 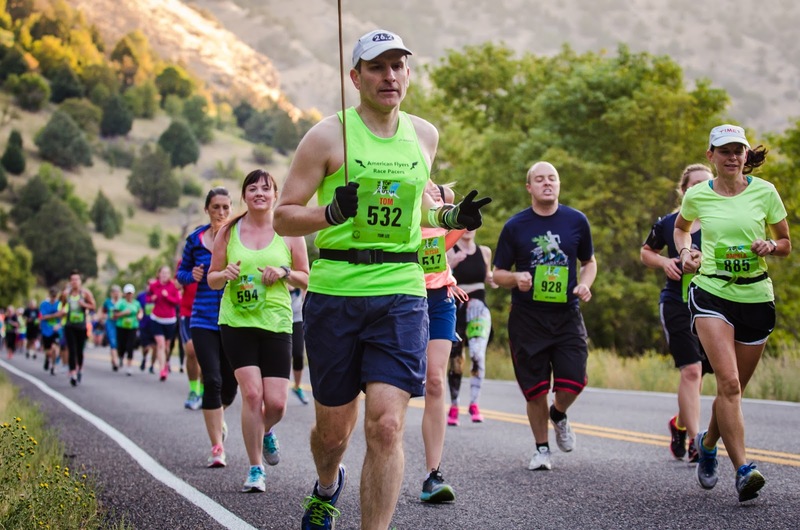 photo courtesy of Top of Utah Half Marathon (Facebook) — can you spot me going to get a last-minute drink of water? 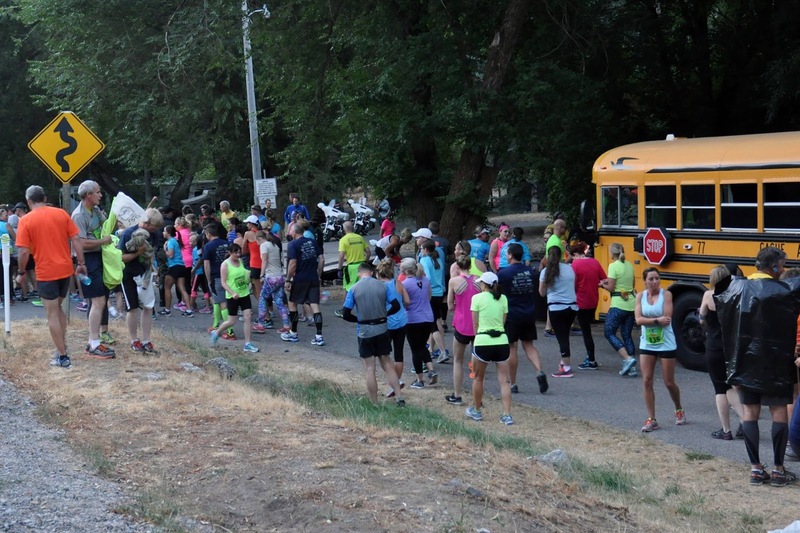 So on Saturday, when I lined up at the start line at 7 A.M., I didn’t quite know what was going to happen. Sure, I had stuck to my training schedule. About a month ago, I had even decided that although I wasn’t initially going to go for a PR (personal record), I might as well train a bit harder just in case I was able to beat it anyway. 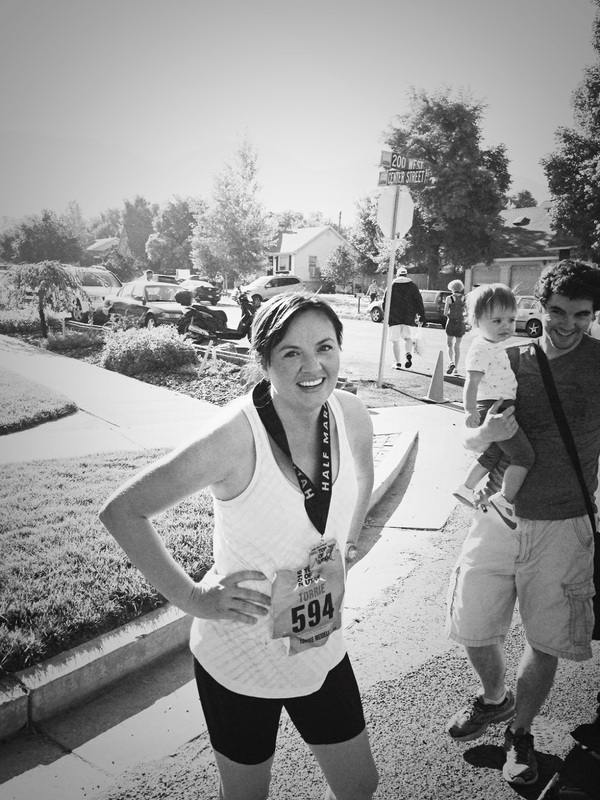 Basically, I wanted to finish this half knowing that I’d put in my best effort, which hopefully meant beating my last time if it was at all humanly possible. 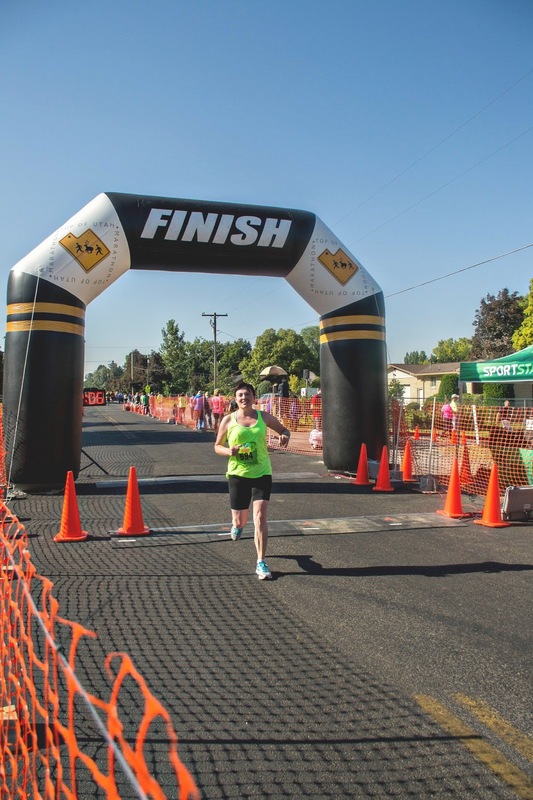 My plan for beating my last time was simple—keep all miles under ten minutes, with about 5 of them being around 9:30, and the last 0.1 mile sprinting as fast as my remaining energy allowed. This was what I had trained for. If everything went as planned, I would be able to beat my last time by mere seconds. Eleven miles in on Saturday’s race, I’d kept ALL of my miles at 9:30 or less, including one in the eight-minute range and several more of my miles mere seconds from it. It was then that I realized that I was going to CRUSH my expected time and that I was able to see, for the first time ever, that I was, in fact, capable of running a half in under two hours (although it wouldn’t quite be happening on this particular day), a goal I had set years ago but never quite believed that I would achieve. A big thank you to my mom and stepdad and my friend Kayla and her husband for coming out to see me finish (as well as Matt and Raven). It’s thanks to my mom and stepdad that I have pictures at all, actually, since I didn’t charge my camera’s battery the night before so Matt couldn’t get any pictures. As I sprinted across the finish line with my end time reading 2:02:59, I almost cried with the exultation of suddenly realizing that I had beat my last time by over five minutes, despite weighing almost 10 pounds more, despite not being able to run quite as fast as before in general, despite my muscle disease (which had officially gone into remission only about five or six months ago). In other words, I had done what I thought was impossible, and I still felt at the end that I could have maybe given just a little bit more. I’m so thankful to my Heavenly Father for giving me a miracle when I so sorely needed one–the year ahead is already looking much brighter than the last.